Collard greens are dark-colored, leafy green vegetables belonging to the Brassica family, a group that includes broccoli and cabbage among its members. East Africa, South America, Southern Europe, and the Southeastern United States are regions that count collard greens as a staple vegetable in their diets. Collard greens are famous for being nutritionally dense and very low in calories. Vitamin K, the most abundant vitamin in collard greens, lessens the risk of bone fractures by improving calcium absorption, modifying bone matrix proteins, and reducing urinary excretion of calcium. Just one cup of collard greens can provide over 770 micrograms or over 100 percent of the recommended daily intake. Collard greens can maintain healthy skin and hair. Vitamin A, a vitamin collard greens have in generous amounts, is essential for the growth of skin and hair. Moreover, vitamin A is also necessary for the production of sebum, a substance that keeps the hair moisturized. Vitamin C is needed for collagen building and maintenance, and is found in collard greens. Collard greens offer exceptional cardiovascular support. The fiber-related nutrients in collard greens can lower cholesterol, while glucosinolates trigger anti-inflammatory activity in the cardiovascular system. Because collard greens are rich in vitamin K, they should be carefully monitored by individuals taking blood thinners. This vitamin plays a major role in blood clotting, and suddenly decreasing or increasing the intake of collard greens could influence the effects of the blood thinners. 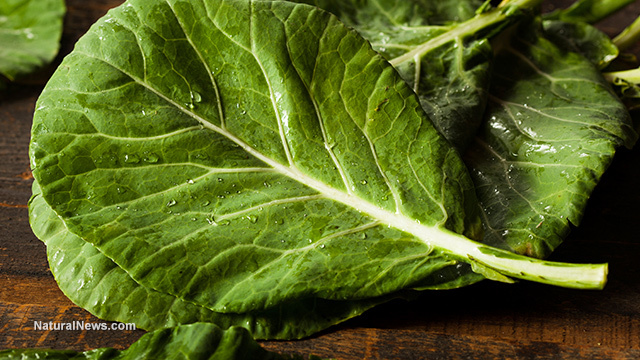 Individuals with thyroid dysfunction should avoid collard greens. Similar to other members of the Brassica family, collard greens may contain goitrogens, substances that cause the thyroid gland to swell. As a vegetable that’s regularly eaten in multiple parts of the world, there are scores of recipes that use collard greens. From Africa, there’s ye’abesha gomen or collard greens cooked with Ethiopian-style spiced butter, cardamom, fenugreek, and nigella seeds. From Brazil, there’s sopa de fuba, a soup made from collard greens, cornmeal, and sausage. A soft-shell crab sandwich, a classic sandwich from the East Coast, can be made more flavorful with a collard greens slaw. Collard greens lessen the risk of bone fractures due to their high vitamin K content. These leafy vegetables are also an excellent source of vitamin A, making them essential for healthy skin and hair. Collard greens help support the cardiovascular system. Due to their high vitamin K content, collard green consumption should be carefully monitored, especially for those on blood thinners.